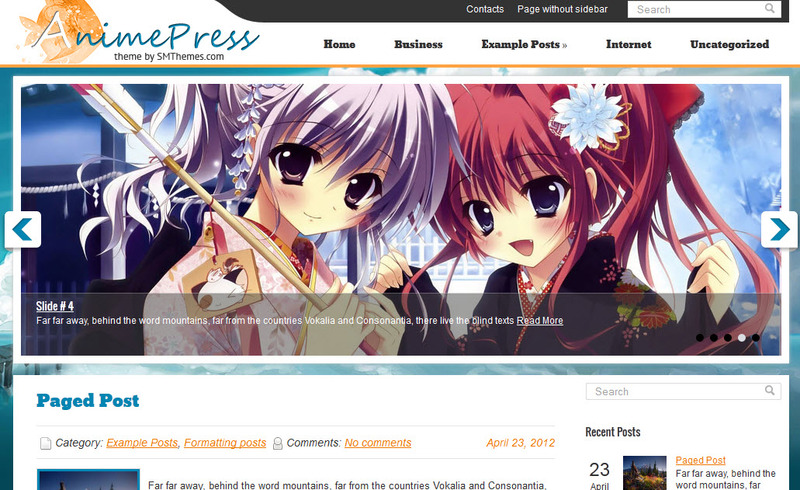 Have your own anime WordPress site with the outstanding theme in blue and white – AnimePress. The extraordinary fonts used for the menus and the lovely shades of blue, chosen for the backgrounds give a fresh and attractive look to the site. It is a great base for a terrific blog, where you can use a wide range of tools to include and highlight the content. One of the advantages of the theme is the simple layout that neatly organizes your site in easy for navigation sections. The layout is responsive, which means that your modern site has the ability to adjust and keeps its functionality and appearance to different digital devices and screens used for browsing. Your visitors will enjoy the convenient horizontal menus on the top of the first page, just above the welcoming slideshow you can create to make a great first impression. The theme is slider ready and SEO optimized. It features abundance of instruments for formatting and editing of each blog post, so you can create your site according to your unique and extraordinary style. The site is easy for browsing through, and for following, via the social networks and the section for recent comments, videos and the categories for posts.